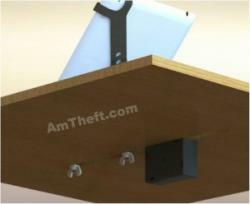 AnyTab Interactive Mechanical Tablet Protection - American Theft Prevention Products, Inc. The AnyTab Interactive is a non-alarming security device that lets your customer pick up and handle a tablet, while still keeping your display neat and secure. 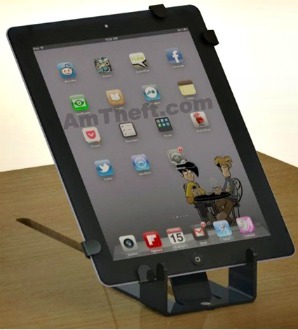 The AnyTab Interactive's univeral mechanical tablet bracket easily adjusts to tablets ranging from 7 to 11 inches. 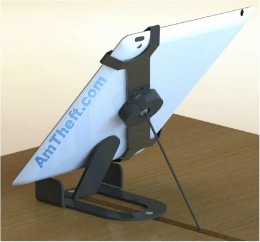 Utilizing Sennco's patented mechanical tether and two reinforced grips, the AnyTab interactive fortifiies tablet displays without sacrificing your customer's expericence. 36" cable. This includeds the full length of the pull from the Cordwinder. Easily Adjustable to fit tablet ranging from 7" to 11". Simple Self installation. Cordwinder is mounted under counter and stand is bolted, or adhered to counter. The AnyTab Interactive helps increase sales by displaying allowing you to display a live unit which customer can inteact with.